The church is officially called Queen of the Catholic saint, from meaning Virgin Mary is the Queen all saints. Later we called for short Mary Hanoi church and also is next Cua Bac of Thang Long citadel should also familiar called Cua Bac church. 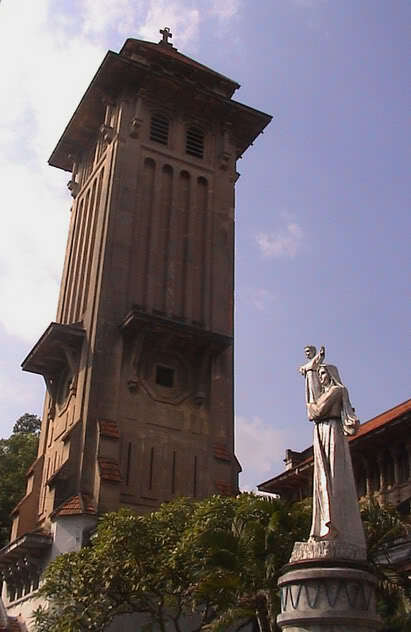 Cua Bac church was built from 1925 to 1930 on parcels of land stretching along the city streets, Phan Dinh Phung and Nguyen Bieu street. The church includes a large rectangular space with two long parallel columns with the two sides, is divided into a relatively small space and a welcoming space for a pastor solemn ceremony . Between these two regions is a major transitional space below the dome, the space must be a worship of saints, the left is the reception room of the pastor. Interior space is made and decorated entirely European-style church. French architect: Ernest Hébrard has created an architectural space a non-symmetrical with bell tower soaring high side of the main hall. 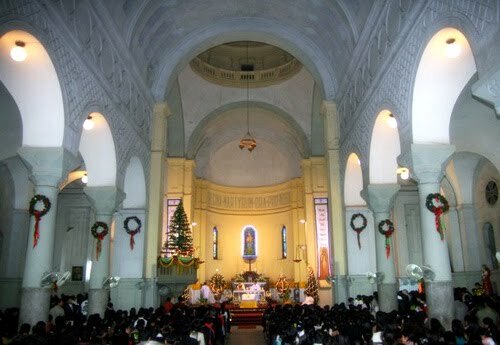 This makes Cua Bac church has special characteristics compared with most Christian works in the form of symmetric which the French usually built in Vietnam. There are authors that this is the special creation of Hébrard to create the suitable landscape areas but essentially this is just a clever way to exploit a combination of church principles of the Renaissance, the so that Cua Bac church, outside the bell tower as a point also has a dome in the center. Roof system is drawn from the dome through bell tower to the main and auxiliary space makes us see a familiar landscape as it was caught in the traditional temple, pagoda of Vietnamese villages . System windows, doors get light and ventilation are processed against rain and sun sneezing, except for doors and decorative lighting from large glass optical block, maximizing the system of green plants making the landscape more closely, friendly nature. The combination of traditional architectural with other forms of Eastern church decorated with traditional harmony of the natural landscape around has created an impression of Christian works. 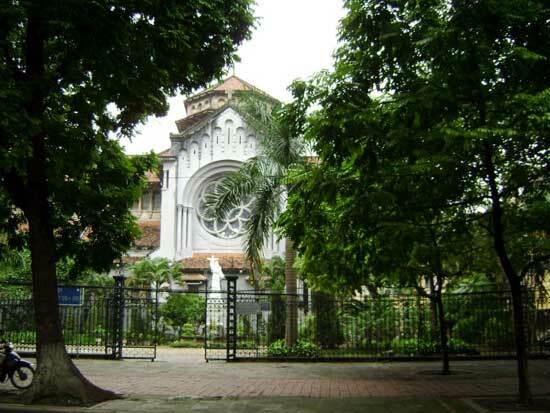 Therefore, Cua Bac church has always been considered as typical architectural style combining European and Vietnam. Nearly a century elapsed, also repaired several times over but so today, Cua Bac church still retain the ancient definition, pristine.